The Sensible Days must go on! This time the world championship of SWOS will take place in Fulda, Germany. 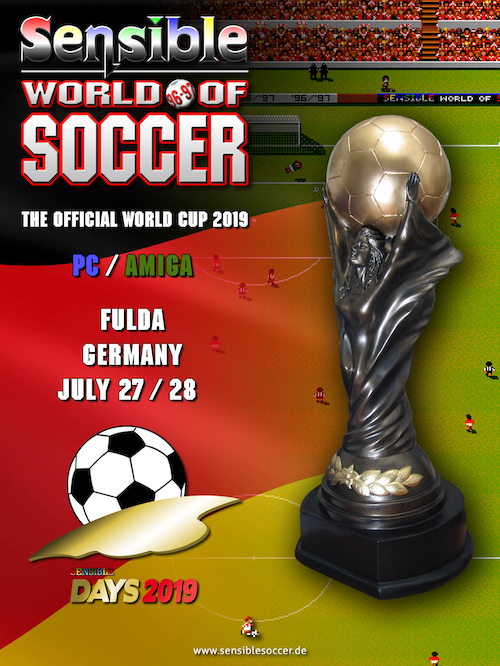 This will be the 16th edition held in the series of the World Cup, and for a second time in Fulda, after 10 years time. A remarkable story in itself, of what started out with just a few players meeting in Pirmasens, is now an ongoing international tradition for many years. We see players travel great distances to play their beloved game and meet with their fellow SWOS friends. During the weekend of 27/28 of July 2019, we will find out who will be crowned as World Champion of SWOS in both PC and Amiga. Along with the 2 main tournaments, a couple of small side-events and cups will also happen. The tournaments are open to anyone, but a pre-payment is mandatory to join the event! This is done to ensure better organizing possibilities, arranging of groups & seedings, amount of equipment needed, getting the right amount of food & drinks etc. If you have any questions regarding the event, feel free to contact the organizers. Contact info is listed below. - 3 overnights from 26-29 July! - Both tournament fees included. ATTENTION: You might be refunded to some extend, if you only stay for 2 nights or 1 night. Nevertheless you have to pay 125 first (as a deposit). FOR NOW WE COULD ORDER 40 BEDS! THERE IS NO GUARANTEE WE CAN OFFER MORE PLACES!! - lunch & dinner incl. The general pricing for joining Days 2019 is higher compared to previous editions due to rent price, general costs, hardware, better food and drinks. However all extra income will be donated to the sensiblesoccer.de organization. Everyone is also welcome to donate money to ensure future editions of the World Cup. This event will take place at the same location as the World Cup in 2009. 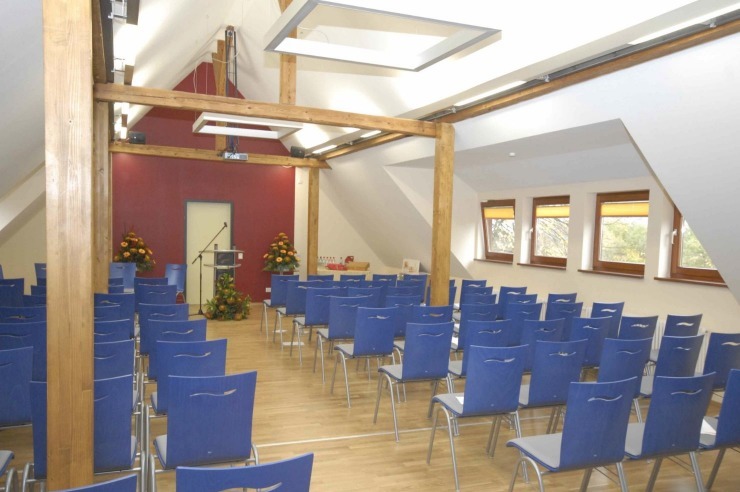 It is a very suitable place for the event, placed just outside of Fulda. It is very easy to come by car or train, and if the Frankfurt airport is just an hour away (by train). The location has proven perfect in 2009 which saw one of the greatest World Cup's ever held. For organizers it is also perfect, as catering is completely taken care of by the Youth Hostel. Beds are divided in several rooms. Due to some restrictions from the Youth Hostel we can only offer one option right now! > Friday 26/7: Arrival day. Meets and greets. Location is open from around 2pm! > Saturday 27/7: PC tournament starts around 12. A small side tournament will be held sometime in the afternoon. Probably Classic Sensible or XBLA. > Sunday 28/7: Amiga tournament starts around 12. A small side tournament will be held sometime in the afternoon. Probably Classic Sensible or XBLA. > Monday 29/7: Breakfast and farewells. People need to leave before 11.30. > 1st Group stage with groups played as DIY leagues. A maxium of 7 players will be in each group. Expected number of groups are 4-6. Players ranked top 4 in the groups are still in the tournament, while the rest can play the optional fun cup known as onion/cucumber tournament. > 2nd Group stage will decide seedings for the knockout rounds which will consist of a Master group (group winners), Super group (runner-ups) and 2nd chance groups (3rd and 4th positions from 1st group stage. Players are placed in groups by drawing from pots made from placements on the ss.de offline / online rankings by the SWOS veterans and organizers. Any original team from SWOS 96-97 may be chosen, and edited through Edited Custom Teams menu, to add a personal touch to your team (names and colors). The home player (the first player of a fixture "Home vs. Guest") is allowed to use a custom tactic. If he does that the guest player is also allowed to load a custom tactic! If the home player doesn't use a custom tactic, the guest is not allowed to use a custom tactic. If a custom tactic is chosen by the home player his opponent may use any available tactic on the disc if he hasn't got his own (except the one from opponent if he does not agree, unless he is not the creator of it)! Optional: Players agree between themselves! (eg. : both games with tactic, or both games without) However, only 1 tactic may be loaded pr. game by each player! - On PC custom tactics are allowed in every match without any restrictions! However, only 1 tactic may be loaded pr. game by each player! You might be refunded to some extend, if you only stay for 2 nights or 1 night. Nevertheless you have to pay 125 first (as a deposit). got the payment for 9 players from Koszalin Poland .... which are the names ?